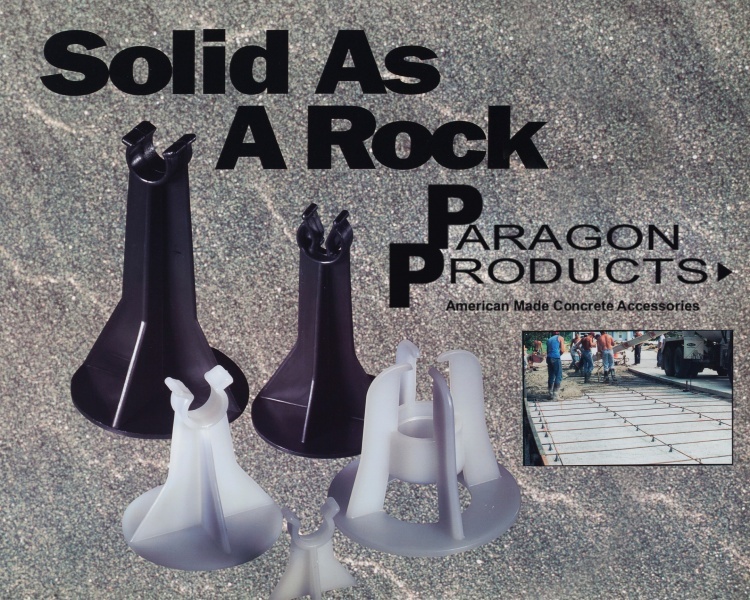 Paragon Products (Paragon) is a proprietary product line of Lomont Molding LLC (Lomont). Founded in 1993, Paragon operates 24 hours a day, 7 days a week. Paragon manufactures American-made concrete rebar supports and accessories. The high-quality rebar accessories are used in the Concrete Test Lab, Construction, Precast, and Ready-Mix markets. Paragon’s product line is ever-changing to meet the needs of our customers. Our sales staff and engineers are continuously researching the markets Paragon serves to evolve the product line to keep up with the various industry demands. Paragon’s in-house molding facility and warehouse storage space enables Paragon to produce high quality products that can be shipped immediately, saving our customers’ time and money. Paragon’s molding capabilities range from 55 to 2,700 tons, processing copolymer thermoplastic resins. Paragon can manufacture parts ranging from a few oz. to 24 lbs. Our products contain recycled plastic.